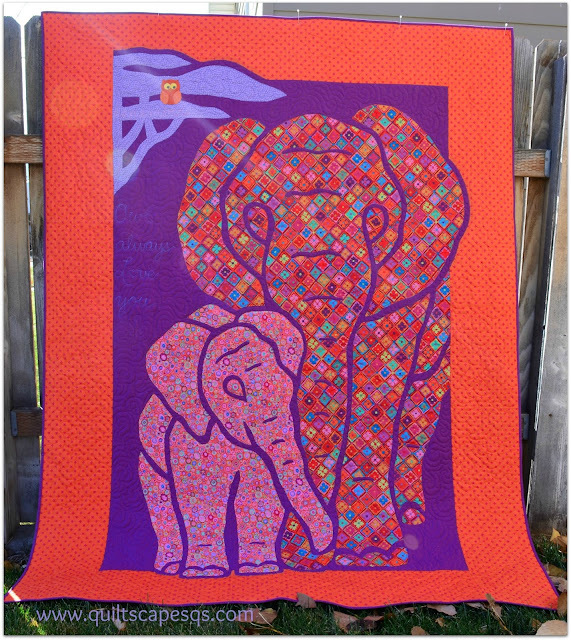 Aunt M Quilt Chronicles, Chapter III: Elephants! 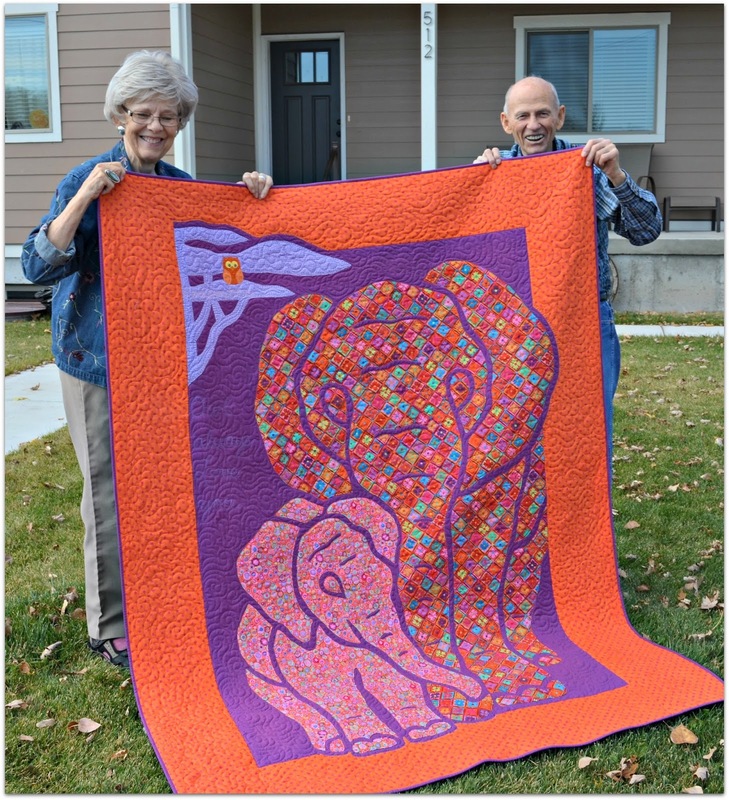 You may recall that my cute little Aunt is on a quest to make quilts for her granddaughters. I've become her quilt-coach (enabler, lol!). First it was a couple of owl quilts, then bears, and now elephants! 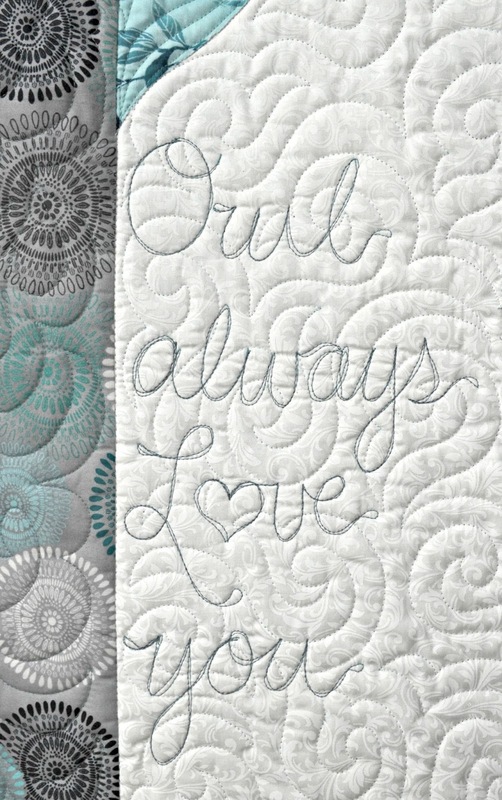 She found a design that she liked, and like any brand new quilter, was totally fearless about the making of it. "We can do that, can't we?" 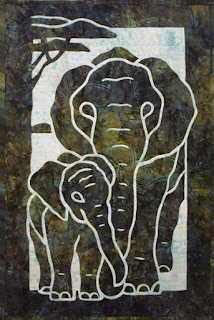 The pattern uses a two-fabric applique' technique, where the fabrics are layered, and the design is cut out, giving a kind of mosaic/stained glass effect. The granddaughters selected colors, and we made a couple of treks to the fabric store where Aunt Marjory is making new friends. Since the pattern only makes a 24" x 36" quilt and she wanted 60" x 72" lap quilts, we had to make some adjustments. I borrowed an overhead projector from the local 4-H office, pinned the fabrics to the wall, then projected the pattern over the fabric, adjusted to the size we needed, then traced it with chalk and handed it off to Uncle Jack, our designated "cutter-outer". Once I had the background stitched together with a border, I had to perform a little tricky reverse-applique' to get the same look as the original pattern so that it appeared that the design was growing out of the borders. Then the only task was to lay out the pieces and glue them in place, ready to "Appli-quilt" on the longarm. That 505 spray adhesive works perfectly. 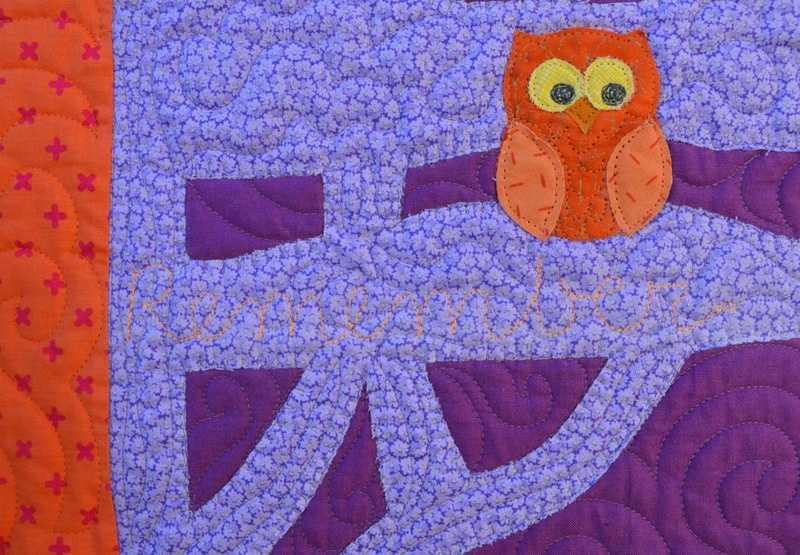 Aunt Marjory wanted to keep her theme of "Owl always love you" for these quilts, so we added a mini owl in the tree (don't know if there are owls in sub-Saharan deserts of Africa, but it works!) 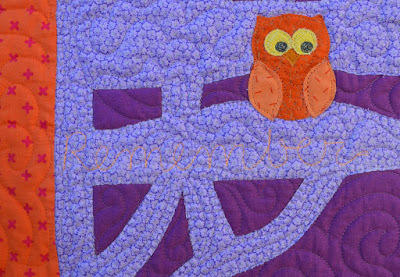 and she had me quilt "Remember, owl always love you" in the quilt. You know, because elephants always remember. So two more down, three to go, for the granddaughters, that is. She's thinking about a dragon, unicorn or Pegasus next. You know how it is ~ once you catch the bug, you just can't quit! That is so stinking cute. My local shop sells that pattern, and I keep thinking that I need to buy it. How cute those turned out! Love, love, love the elephant quilt ... great colors too! Yes there are owls in Africa. Wow...that is amazing! You two are doing a great job. Awesome quilt, I have two Great Granddaughters that would love one. Wish you would come to my home and help me make it. 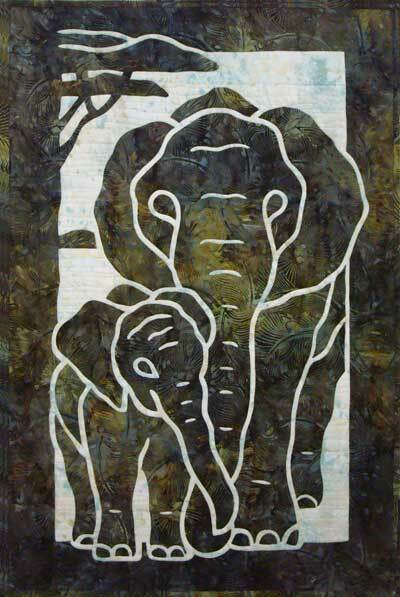 Those elephants...love, love, love them! Oh dear. I signed out by mistake; how embarrassing. I'm not sure if you got my comment so I'll do it again. You are always so innovative. It is a wonderful quilt. Is there a way to purchase the pattern. I know you enlarged it so I'm talking about the original pattern. Thanks, Deonn. Yes, you can find the pattern by clicking the link below the 2nd picture in this post. 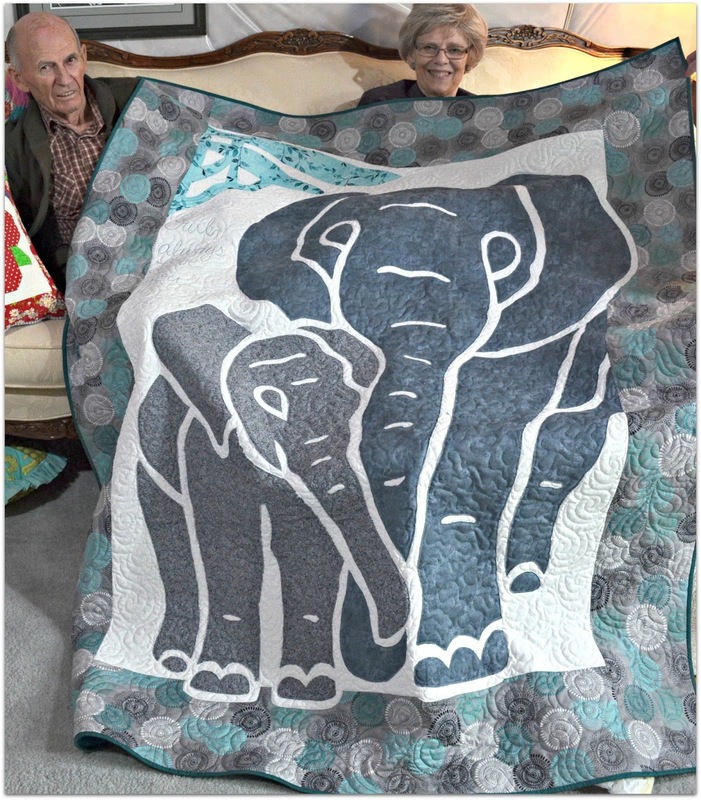 It is by Pacific Rim Quilt Company. Have fun! Hi Deonn, I just happened across your blog. 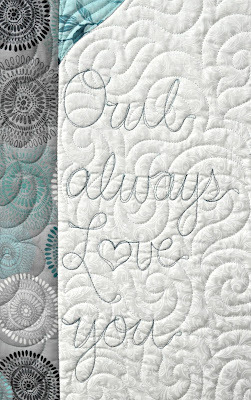 I am the owner of Pacific Rim Quilt Company and wanted to say how simply amazing these are!!!!! I just am in awww. I have pinned the photos but may I have your permission to share them on Pacific Rim's Facebook page and in our gallery? Thank you for crediting the pattern as well! Hi, Connie, thank you! And thanks for asking - please share. Aunt Marjory will be so pleased that you noticed.